Is the Son “Equal To God”? – A reflection on an article from a Trinitarian Subordinationist | J.W. Wartick -"Always Have a Reason"
Denny Burk argues that the Son “should” not pursue “equality with God” and the phrases “form of God” and “equality with God” are not synonymous. He surveys the use of the Greek article and concludes that the use in this instance is not anaphoric–basically the use of one expression carrying the meaning of another in context (I’m not linguist, so I hope I explained this adequately). Granting this distinction, I would suggest that Burk goes too far in concluding the Son is eternally subordinate and in fact arguing that the Son is inequal to the Father. The Son , he argues, is in the form of God, but should not pursue “equality with God.” The final sentences of his article make this clear: “Therefore, in Paul’s Christology ‘form of God’ is something that Jesus possessed by virtue of his deity, while ‘equality with God’ is not. In fact, ‘equality with God’ is best understood as a role that Jesus refused to pursue so that he could pursue his redemptive work in the incarnation” (104, cited below). Unequal Persons of the Godhead? P1- If two persons are “unequal,” those persons are not of the same essence. P2- If the Son is not “equal to God” to the same extent that the Father is “equal to God” then there is ontological division in the Trinity. Unfortunately, we again run into the problem that without a demonstration of P2, it begs the question against Burk (and subordinationists who would use the same language). However, I think P2 is even more defensible than P1, so the establishing of P2 shall be the brief project to demonstrate Burk (and any who agree) have crossed the line with subordinationism into undermining the ontological unity of the Trinity. There is no little danger in treating “God” as a kind of distinct entity from “Father,” “Son,” and “Spirit” because we may collapse into not just tritheism but rather quadri-theism where there is God, and then the the other three divine persons. Burk’s lack of defining what is meant by “equal to God” in his expressions seem to cross into this territory. My defense of P2 will be quite simple. First, Christianity holds that Jesus is God. Period. Ergo, Jesus is equal to God. If Jesus is not just as “equal to God” as God the Father, then Jesus is not God but rather the Father is God and Jesus is some sort of quasi-divine entity having the “form of” but not “equality” with God. Second, if we argue that two beings, x and y, do not equally share some aspect of nature, z, then it follows that x and y are not both essentially z. Converting that to our discussion of the Trinity, if we suppose that the Son and the Father do not equally have “equality to God,” then surely it must follow that the Son is not essentially God. The substance of the Godhead is not united in this view, but rather divided. If one wants to argue that I am mistaken here, I’d simply ask for a defense of the opposite position. How can there be two entities that are not both reflecting some attribute but who are then said to both be that attribute? Again, we run into the great difficulty that Burk never does (in this article) adequately explain what he means by “equal to God.” It seems he is using this phrase as though “equal to God” is semantically equivalent to “equal to the Father” but then Burk’s position surely assumes quite a bit and reads subordinationism into the text rather deriving it from this text. After all, we know that Paul is perfectly capable of referencing God as “Father” so if he meant to say that the Son “should not” (using Burk’s terminology) pursue equality to the Father, he could have just said that. These statements lead us to a related difficulty–one related to the first I noted in this section: Burk’s position seems to either turn into equivocation between “God” and “God the Father” without any distinctions (as just noted) or it seems to treat “God” as a distinct entity from the Trinitarian persons. But either of these is extremely problematic. Moreover, one is forced to wonder how one might say of God the Son that he is God but not like God in every respect. How might one conclude that the persons of the Trinity are of one being if one is “equal to God” in role, but another is not? Burk offers little reason to think this is possible, and simply avers to roles within the Trinity. I contend that this offers little comfort to those with concerns over the possible ontological division within the Trinity coming from subordinationism. I believe that P1 (properly construed) and P2 are each correct and that Burk’s subordinationism–along with any others who would draw similar conclusions–does indeed ontologically split the Trinity. Moreover, I believe that Burk fails to adequately ground any reason for thinking his position does not break the essential nature of the unity and the one being of the Godhead. It is well and good to assert different roles within the Trinity, but when one “role” is “equality to God,” and that “role” is not shared by all the persons of the Trinity, the implications for Trinitarian theology seem deleterious. It is certainly possible I am misunderstanding Burk on these points, but it seems the conclusions I’ve drawn follow from his position. I’m happy to be corrected on this. I must, for now, conclude with a rhetorical question: In what sense can we affirm that the Son is God if the Son is not “equal to” God? Denny Burk, “Christ’s Functiona Subordination in Philippians 2:6: A Grammatical Note with Trinitarian Implications” in The New Evangelical Subordinationism? eds Dennis Jowers and H. Wayne House (Eugene, OR: Pickwick, 2012). « Sunday Quote!- Sanctification by Faith Alone? Athanasius was largely responsible for the point of view that we now know as Trinitarian theology and in the process he fought against Arianism, which included many subordinationalist leanings in its teachings. One thing I have learned is that after centuries of debate, it’s a little premature to declare that we have it all figured out. Thank you for this post J.W. I would like to suggest a book that might help in this re-hash of a very old issue: Look at the writings of Marius Victorinus as translated (and explained) by Mary Clark R.S.C.J. Victorinus, twenty years or so after Niceae, actually developed the philosophy to undergird the theology of the Trinity in 358 (or so) AD. Arius and his followers may have been anathmatized, but Athanasius’ creed was only dogma after written, and meant as a leap of faith for believers with no philosophy to explain it. But in reading his work, you will understand the philosophy of equality of substance necessary to keep each person of the Godhead equal, and where the problems of subordinationism causes to our salvation through Jesus Christ. Thanks for sharing the recommendation! I’ll see if I can slot that in to my historical theology reading list soon! I think it’s important to acknowledge that prominent complementarians like Denny Burke are motivated to read the subordinationism of the Son to the Father into the texts for the express purpose of defending their position of the eternal subordination of women to men. It is discouraging that so many “in the pews” are buying into this poorly developed argument. I think they are on very shaky ground. Thanks for pointing out the poor logic of this work! Thanks for stopping by! 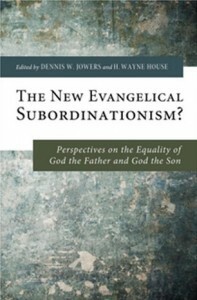 I am a bit hesitant to specifically link the two, because it is true that there are egalitarians who are subordinationists and vice versa, but there are some interesting historical lines of development that link eternal subordination to complementarianism. I’m not saying they are entirely linked, but the way complementarians often used subordination as a bulwark for their position is pretty interesting. I think there’s a real danger in using anthropology to determine doctrine of God. “All then that the Son and the Spirit have is from the Father, even their very being: and unless the Father is, neither the Son nor the Spirit is. And unless the Father possesses a certain attribute, neither the Son nor the Spirit possesses it: and through the Father, that is, because of the Father’s existence, the Son and the Spirit exist, and through the Father, that is, because of the Father having the qualities, the Son and the Spirit have all their qualities, those of being unbegotten, and of [begotten] and of procession being excepted. For in these hypostatic or personal properties alone do the three holy subsistences differ from each other, being indivisibly divided not by essence but by the distinguishing mark of their proper and peculiar subsistence. The only difference in the Persons is their origin, and this is their distinct mode of existence. Both the Spirit and the Son are derived from the Father, which makes them Personally distinct. But they also share one simple Nature and natural energies which permits no distinction in Will, Essence or Energies. This gets confused further when folks quote Jesus and forget that there is only one Personal agent in him yet he speaks and acts in two distinct natures. So when Philippians says he lowers himself to take the form of a servant, there is no change in his unchanging divinity, but simply that he takes on our lowly created nature and enobles, transfigures, deifies and raises it up. As St John says above, the only superiority in the Trinity is of causation and only the Father is uncaused.